Dana designs the most technologically advanced product solutions to fit specific needs. Our electronic window connector gasket employs the latest industry advancements to provide reliable power connections for a variety of plug-ins. Here, sealed wiring sends an electronic signal directly through the “window” in the gasket that removes potential leak paths and helps lower vehicle costs. 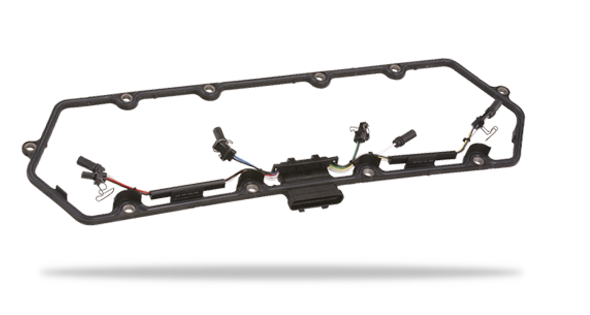 The window gasket provides power connections to activate components, such as solenoids, actuators, sensors, and fuel injectors. Since electrical connections are completed before mating components are even assembled, service can still be easily performed. Connections are checked to ensure signal integrity from each circuit, while an integrated wiring harness transmits the power to reduce system complexity and cost, while helping increase profitability.